At the SEYM 2015 Annual Gathering in April, Friends approved a minute from the SEYM Committee for Ministry on Racism committing us to an annual “SEYM read-in,” followed by discussion and/or worship sharing of an article or pamphlet. 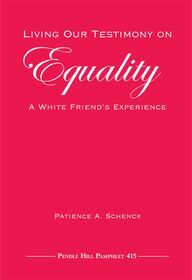 The 2015 selection is Patience Schenck’s Pendle Hill pamphlet, Living Our Testimony of Equality: A White Friend’s Experience. Why? If you’ve seen any news media in the last year, you know why: Because despite gains and many good intentions, we still live in a world of racism. People of Color live everyday with the inadequacy of 2015 racial justice, and as Wendell Berry has noted, whites live that “mirror image.” It isn’t enough to think good thoughts and be polite. Whites need to be willing to look at our subconscious attitudes and see how institutional racism affects all of us. A retired educator, Schenck tells about growing up white in a family committed to racial justice, but only so far. And later, she details her increasing awareness of the depth of racism. Many whites think talking about race only makes us feel depressed and hopeless. Others can’t discuss race without telling once again what good friends we are with someone of another color. But do we know his last name? Probably not. How many phone numbers of People of Color do whites have memorized or in our cell phones? In addition, Schenck’s pamphlet offers discussion questions for individual Friends and Friends meetings. Orlando Friends have also suggested reading The New Jim Crow and Fit for Freedom, Not for Friendship. Reading Schencke’s 36-page pamphlet will increase our awareness in perhaps painful ways, but as Schenck said in a Friends Journal article (“Patience Schenck on Privilege” 1/2013), “If we don’t take risks, we won’t move forward” and “Everyone benefits from diversity.” The Pendle Hill Pamphlet may be ordered by calling the FGC Bookstore at Pendle Hill at 1-800-966-4556.